Ineffective Holy Spirit - Website of reckersworld! However, if you are a Christian and you have discussed your experiences with other Christians you will find that the standard experience is simply just a bit of a buzz, nothing more. This buzz usually takes place when meditating or in a room full of people where the music and atmosphere can bring on a sense of euphoria, much like you might get in a rock concert. This buzz will always be put down to Christians as a touch from God or the Holy Spirit. 1) It will be given to those who ask. Luke 11:11-13 Which of you fathers, if your son asks for a fish, will give him a snake instead? Or if he asks for an egg, will give him a scorpion? If you then, though you are evil, know how to give good gifts to your children, how much more will your Father in heaven give the Holy Spirit to those who ask him?" 4) Will teach all things and bring all things to remembrance. There is no guarantee you'll be able to recall scripture and give convincing answers to questions when they are asked. The Holy Spirit is not effective enough to minister to the new convert without other Christians being involved to guide and teach them. It requires regular contact with other Christians to validate your beliefs and prevent you from backsliding. Also see my article "Understanding the Bible"
All damning evidence that the Holy Spirit is either ineffective or non-existent. 4) Every spirit-filled Christian I know agrees with everything I say about God and the Bible. 5) Every true Christian church in my city operates under the same doctrines. 6) I feel convicted over every sin I commit. 7) I always know what to do in any situation when it comes to my Christian walk. 8) I always feel bold when it comes to sharing my faith. 9) I am always able to cast out demons when the need arises. 10) I am able to teach and guide other Christians. All Christians would be able to give a consistent interpretation of the bible. There would be no disagreements about any given scripture. 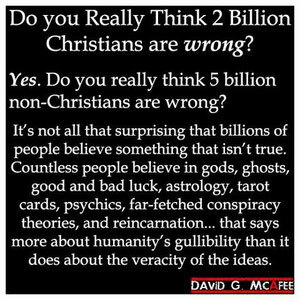 Every Christian would have an arsenal of convincing arguments that could convince even the hardest sceptic. After all, the Holy Spirit should be far superior in debate than any Atheist. There will be unity in every Christian church and no disagreements on doctrine. There would be no need for mature Christians to guide the new ones. Many Christians reading this will want to downplay the role of the Holy Spirit at this point and claim that our freewill will trump the teaching of the Holy Spirit. They will say that even though the Holy Spirit may prompt a Christian, it does not control what they say or do. Maybe not, but still clearly the bible makes false claims about the potency of the Holy Spirit. Furthermore, until the sceptic can see unity amongst Christians, how can any unbeliever be expected to take anything Christians say seriously? This is not a minor issue here, this is huge and until it is resolved, very few people will get the right message from the bible and billions will burn in Hell because of it. Every Christian church in the city should send a representative to a combined meeting. Each representative will be chosen by the people in their congregation based on who they respect and admire the most for their Godliness and wisdom. These representatives can then meet and determine a representative for the city, once again based on who appears to be the truest Christian out of them. All the major cities can then send in their representatives for yet another meeting, this one for their entire country. If necessary, they could elect further representatives, perhaps to meet for a worldwide meeting. With the Holy Spirit in charge, I’m sure just these smaller groups would do fine as now we have weeded out the false Christians and have a bunch of True Christians who are holy spirit filled and who are all hearing from God himself. These groups will then be able to go through the bible with a fine toothcomb and determine the correct interpretations and explanations for everything, thus showing Christian unity and thus being able to publicise once and for all, the true interpretations of scripture. There would then no longer need to be any more denominations, arguments and disunity. There would be just one united church under God and thus the prayer of Jesus and the desires of Paul will at last be fulfilled. Is this too much to ask? Is it a fantasy? Surely not! With God all things are possible and surely he would want his people to get the correct interpretation of his word? Surely the Holy Spirit will impart consistent wisdom to those few truly spirit-filled Christians? Yes, it is too much to ask, isn’t it? Because even the staunchest of Christians knows that there is no way anyone is going to be able to come to an agreement on what the bible is saying. They know that the Holy Spirit is incapable of achieving such a thing. There will continue to be thousands of denominations, religions, sects and cults because the bible is just way too open for interpretation. There is no supernatural entity coming upon people to help them gain a correct understanding of scripture. There is no magical being giving people the words to say or empowering them with strength. There just isn’t and you know it!